Android 5.0 was announced at the Google developer conference as "Android L," but now has the official name of Android Lollipop. It's a significant upgrade, as is implied with the change from 4.4 (KitKat) to 5.0. Android Lollipop is adding more devices into the fold. Android KitKat began supporting Android Wear watches as well as phones and tablets. Lollipop adds support for connected TVs, cars, and other devices. That's a lot of different types of screens and different needs. Using Lollipop, you can better share your content across devices, such as starting a song on you watch and continuing it on your tablet. It also changes how content displays on different devices to take into account the form factor and purpose. Google's example for this is that tablets display a full inbox and list of recent messages along with that email message, while your watch should only show the most recent message. The Android OS is getting a makeover with a more modern look that includes drop shadows, transparency and layering. The idea behind this is that elements will have a 3-D look and feel, or a "z-index" as designers call it. So your menus can stack upon each other and have the illusion of depth. This also allows for new gaming possibilities as soon as developers have a chance to take advantage of the new features. Beyond just the new interface pretties, the user interface is designed to be more functional and allow you to more quickly access settings or act upon notifications. Android Lollipop will have the ability to screen alerts for importance. If you hate getting swamped with constant new message alerts, setting priorities should be simpler and more efficient. This filtering will appear in other areas, such as notifications. Enhanced notifications will appear on the lock screen, so you can just pick up your phone without unlocking it to see if you've got any urgent messages. Android Lollipop adds the ability to turn off power drains when your phone starts to get low on juice. Google claims this can add up to 90 minutes of extra battery time to your device. This is important as fewer and fewer devices offer the option to swap out batteries. You already have the ability to add multiple users to your tablets, but Android Lollipop is extending your ability to do this with more devices and better features to protect your data. You can also intelligently pair your device with another trusted device, such as your watch or your car, so it always unlocks when it's near your Android Wear watch but needs the password phrase when it is not. That means you won't have to struggle with unlocking your phone to put on some tunes without leaving your device unlocked for everyone. Google suggests that you can use the guest users feature to share a phone between friends of family members. For example, if I forget my phone when I'm out shopping with my family, I could grab my husband's phone and log in as a guest. I'd still have access to my contacts, and as soon as I logged out, my husband would not. Overview is basically a replacement for the "recent apps" function on previous devices. Use this to see a 3-D stacked deck of "cards" that represent the different running tasks. You can switch between them like you switch between tabs in a Web browser. 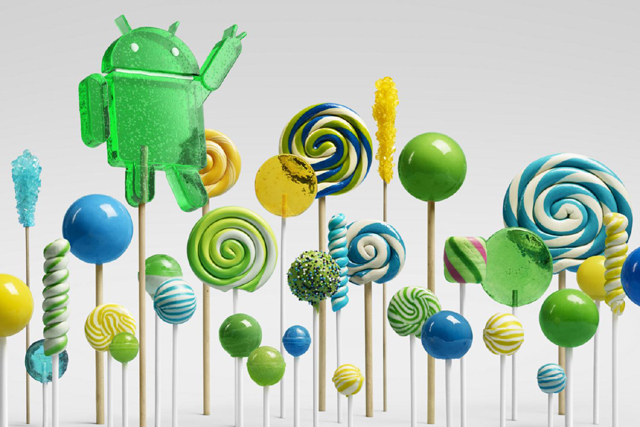 Android 5.0 Lollipop will ship with new Nexus 6 phones and Nexus 9 tablets now. It will also be available as an upgrade for many other modern phones. No word on exact timing, since some devices require more Android adaptation than others, but users of the HTC One M8, Samsung S5, and LG G3 are likely to get updates sometime in late 2014 or early 2015. No guarantees, though. The timing and availability depends on the device manufacturer.